The 1997 Uphaar fire tragedy in New Delhi killing 59 patrons of a cinema-hall, was a man-made disaster, from which India has hardly learnt any lessons, either in preventing similar tragedies, or in ensuring appropriate punishment to those found guilty of causing them. 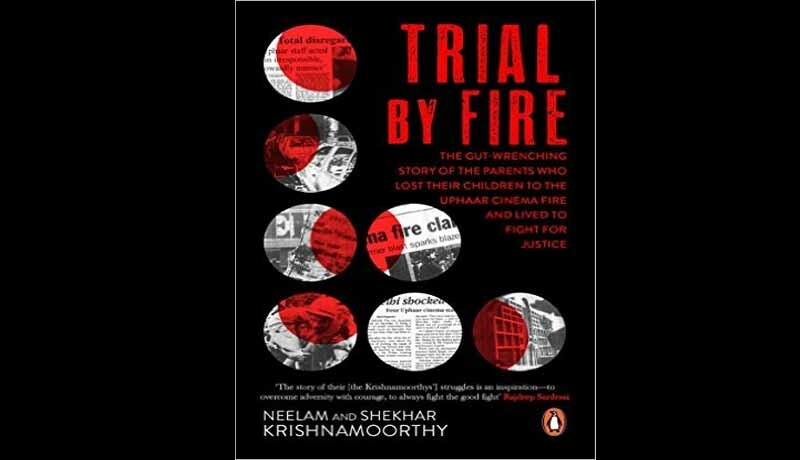 Neelam and Shekhar Krishnamoorthy of Association of Victims of Uphaar Tragedy (AVUT) have, in their recent book, ‘Trial By Fire’ [Penguin Random House], lucidly brought out their challenges in pursuing the legal struggle to ensure (rather, failure to ensure) justice in the case. In the process of telling their own story during the past 19 years, they have thrown sufficient light on what ails our disaster preparedness in terms of insufficient legal framework, and poor justice delivery system. Theirs is a story of how as lay persons, they began to learn the intricacies of India’s laws and courts, in order to effectively contribute to the judicial decision-making. Theirs is also a story of how a litigant-victim, fighting a large corporation, has to brave threats, intimidations, and even insults, in pursuit of justice, risking everything. AVUT’s objectives go beyond securing justice for Uphaar victims. They include, among others, creation of public awareness of criminal negligence on the part of owners and occupiers of public places, and ensuring implementation and upgrading of safety laws. AVUT’s website, www. rememberuphaar.com updates their campaigns and struggles. On December 14, a three-Judge bench of the Supreme Court’s Justices Ranjan Gogoi, Kurian Joseph and Adarsh Kumar Goel, reserved its judgment in the review petitions filed by the CBI and AVUT, pointing out errors apparent on the face of the record in the Court’s previous judgment reducing the sentence of imprisonment of the accused to the period already undergone by them. Another bench led by Justice Anil R Dave, who has since retired, and comprising justices Kurian Joseph and Adarsh Kumar Goel, had, on August 19, 2015, allowed the accused brothers and owners of the Uphaar cinema hall, Sushil and Gopal Ansal, to pay Rs.30 crores each in lieu of the remaining part of the two-year sentence of imprisonment. In this interview to LiveLaw, Neelam and Shekhar, reflect on their struggle, and what lies ahead. LL: Thank you for writing this poignant, as well as instructive book. AVUT’s objectives, as outlined in p.39 of the book, are laudable. The first objective, as you say, is to fight for justice and to take legal proceedings to their logical conclusion, so that there is deterrence and man-made tragedies like Uphaar are not repeated. Your preoccupation with this objective in Uphaar case has obviously limited your efforts in pursuing the other five objectives. One gets the feeling that you feel exasperated, as your efforts so far have not yielded the desired results, with the Governments and the courts not displaying the requisite commitment to these goals. Is it because disaster-prevention and speedy justice to disaster victims are not election issues? N&SK: We have witnessed in last twenty years that disaster prevention and speedy justice are never election issues. These two issues never reflect in the manifesto of any political party. In the aftermath of any man-made disaster it is often seen that political parties, to score brownie points, rush to the site of the disaster. The Government very promptly announces an ex gratia compensation .They make rhetorical statement that the people responsible for the deaths would be brought to book. But unfortunately no steps are taken to ensure that justice is served. LL: You have discussed the stay on delicensing of the Uphaar cinema hall because of violation of safety regulations, granted by the Delhi High Court in 1983. Though the stay was initially for just four days, how did it get extended till the disaster? What were the reasons cited by the Delhi high court for the stay, and its continuance beyond four days? You say that the Court did not think it could suo motu vacate the stay, but it did precisely that once the 1997 disaster happened. Can you name the Judges in 1983 and 1989 (when the first fire accident in Uphaar took place), who heard the case, when the stay could have been reviewed, and vacated by the Delhi high court? What is the legal situation now? Can authorities issue temporary permits to cinema halls? N&SK : The four days stay was granted by the High court of Delhi in 1983 by Justice D R Khanna. This order was made absolute in the year 1986 by Justice Yogeshwar Dayal and Justice Mahinder Narain. While making the stay absolute the High Court had directed the DCP ( Licensing ) Delhi Police to ensure compliance of fire safety standards and in case of non-compliance of safety standards the Licensing authority was at liberty to move the court for variation of stay. It is ironic that the Licensing Authority neither approached the court to vacate the stay nor did it inform the court about the serious fire in 1989. This matter came up for regular hearing in the month of October 1997, four months after the incident when the court cancelled the License . But by this time Uphaar was already sealed by the Prosecuting Agency. It is still under the custody of CBI. As per Delhi Cinematograph Rules 1983 there was a provision for issuing temporary permits for a period of two months. LL: The Delhi Cinematograph Rules 1983 had a provision for issue of temporary permits. Is this provision still there, and used by the authorities to issue temporary permits? Do other cities like Delhi and even small towns have a similar provision in their Cinematograph Rules, for grant of temporary permits? If so, is there a case for their abolition through legislative route or judicial intervention? N&SK : Licensing authority issues the annual license to cinema halls after getting no objection certificate from other Government authorities like Municipal Corporation, Electrical Inspector, Fire Department etc. The temporary permits are only stop gap arrangement which is issued for two months when the Licensing authorities do not receive the no objection certificate from the authorities. To our knowledge, this practice still continues. This clause cannot be abolished totally, but the authorities should be restricted from issuing temporary permits beyond two months. In the case of Uphaar, the temporary permits were continued to be issued for fourteen long years despite various violations and deviations. Each state is governed by its own rules and we are not aware if this clause exists in the Cinematograph Rules of other States and Union Territories. LL: In 1983, who was the Lt. Governor, who cancelled Uphaar’s licence? N&SK : Jagmohan was the Lt . Governor of Delhi then. LL: . Considering that the Uphaar victims died of asphyxia, what are the facilities required to deal with this? N&SK: In Uphaar fire tragedy victims had died due to asphyxia resulting from Carbon Monoxide poisoning and other toxic gases. Hemoglobin, the oxygen carrier of the red blood cells, has a greater affinity for Carbon Monoxide than that for Oxygen. As a result of this, Carbon Monoxide combines with Hemoglobin, displacing Oxygen and thereby reducing the oxygen carrying capacity of blood. The fall in oxygen supply affects the central nervous system resulting in unconsciousness and ultimately death. Hence it is imperative in such a situation the victims should be moved as soon as possible to fresh air and oxygen should be administered. Moreover the people stranded in such a situation should crawl rather than walking out of the premises to avoid inhalation of smoke. To reduce the impact of the toxic gases due to smoke, the public spaces should be provided with “Automatic Opening Vent” ( AOV) . An AOV system is a control system designed to vent air or smoke for use in natural & smoke ventilation. This systems is used mainly to control the ventilation of smoke in a fire. This system is prevalent in other developed countries. However, it is not very common in India in public spaces, but are used by some Industries. Though the installation of smoke extractors is mandatory as per the norms set by Bureau of Indian Standards and National Building Code, their credibility has not yet been proven. LL. You have mentioned that the Government in 1997, took a suo motu decision to transfer the case from the Delhi Police to the CBI, and that CBI agreed to grant of bail to the accused, whereas the Delhi Police had opposed. Looking back, can you tell us who were responsible for this? N&SK : It is a well-known fact that the CBI directly comes under the PMO and Ansals being politically well connected managed to get the investigation transferred to the CBI. It is pertinent to mention here that victims at no point of time had demanded a CBI investigation. LL. You have referred to the DCP (licensing) who allowed 37 out of 43 seats to be retained in Uphaar’s balcony, blocking the right hand side of the gangway, which led to the disaster. What happened to the departmental inquiry against him? N&SK: We are not privy to the outcome of the departmental enquiry. Since the order of DCP Licensing allowing additional seats was contrary to the directions of the High Court, AVUT moved an application in the trial court to summon the then DCP (Licensing) Delhi Police as an accused in July 2004. However, the trial court stated that the matter would be considered at the time of final arguments. While delivering the Judgmemt the court directed further investigation vis a vis the persons who have been left out by CBI in the earlier investigation. Subsequently the High Court while delivering its judgement on the appeal filed by all the accused in December 2008 directed CBI to complete the further investigation as directed by the trial court before 15th March 2009. The CBI filed a closure report on 5th March 2009 thus giving a clean chit to the then DCP (Licensing) despite the finding of the court and clinching evidence against him. In May 2009 AVUT filed a Protest Petition against the closure report filed by CBI. It was in August 2010 that the trial court summoned the then DCP (Licensing) as an accused to face trial under section 304 (A), 337 & 338 of Indian Penal Code. Aggrieved by the summoning order the then DCP (Licensing) moved the High Court for quashing of the summoning order on the grounds that the Magistrate could not have taken cognizance against him without sanction for his prosecution under section 197 of Cr PC. The High Court dismissed his plea in October 2013 directing him to face trial.This was challenged in the Supreme Court which is pending adjudication. LL: You have mentioned that 1989 fire incident was reason enough to infer that the accused had the knowledge that non-compliance with safety regulations would lead to a disaster. Therefore, as “knowledge” is an essential ingredient of Section 304 (II) of Indian Penal Code, which deals with culpable homicide not amounting to murder, why you did not carry your challenge to the CBI’s dilution of this charge to mere negligence, to the Supreme Court? In retrospect, do you regret the decision, because you wanted to avoid further delay? What were the High Court’s reasons for dismissing the challenge? N&SK: We were aware of the Supreme Court verdict of Bhopal Gas Tragedy in 1996 wherein the charges were diluted against the accused from culpable homicide not amounting to murder (Section 304-II) to criminal negligence (Section 304A) of IPC . Subsequently the curative petition filed by CBI in the year 2011 wherein they wanted the restoration of 304 (II) , was dismissed. Hence we do not regret not challenging the High Court verdict in the Supreme Court. LL: In the 1989 fire, you mentioned that many spectators left their footwear, while escaping. Was it as serious as the one in 1997, although there were no casualties, fortunately? N&SK: In an interview to a national daily the then Chief Fire Officer had mentioned this fact. The situation was similar in 1997 . When we visited the cinema with the court commissioners every part of the theatre was a cruel reminder of the horrific incident. There were signs of struggle everywhere. Shoes, ladies’ dupattas, salwars and broken bottles were scattered all over the balcony. LL: Although the Supreme Court has recommended a comprehensive legislation dealing with tortious liability, the Government has not yet taken any initiative. Can AVUT consider moving the Supreme Court for a direction to the Government in this regard? N&SK: We have no plans at the moment. LL: A number of factors have been identified for Uphaar disaster, such as, parapet wall being raised to the roof level, exits being blocked by illegal construction, closure of gangway to make space for additional seats, parking of cars in the immediate vicinity of transformer, non-construction of pit to drain transformer oil, etc. Can we say, the cinema halls today are free of these contributory factors? N&SK: We have not visited cinema halls since 1997. But we are given to understand from friends that the owners of some multiplexes are conscious about the fire safety and are taking all precautions to avoid any catastrophe. But it is very unfortunate that the various suggestions made by the Supreme court in our civil matter which were later reiterated by the bench which delivered the judgement in the criminal matter have not been implemented . Though there is a notification from the Lt Governor of Delhi to implement the suggestions the same is challenged by the National Association of Motion Pictures Exhibitors in the High Court of Delhi. AVUT has also intervened in this matter. LL: You refer to the transfer of the trial court judge, after 36 hearings in the Uphaar case. What was the reason for that sudden transfer, which further delayed the outcome? N&SK: We are not privy to this. We only know that it was an administrative order. LL: You have referred to the Law Commission’s consultation paper, and the proposal to constitute Fatal Incidents Claim Tribunal on the lines of the Motor Accidents Claim Tribunal. Your book shows that the Additional Secretary of the Union Ministry of Law and Justice has at one stage, endorsed this proposal to the Union Home Ministry. Can AVUT move the MHA to take it forward? N&SK: Despite our endeavour to seek audience with the Prime Minister and the Law Minister , we have not received any response . It is very unfortunate that though the nation has witnessed many manmade disasters after Uphaar the government has not come out of its slumber. We believe that Government and its instrumentalities act only when there is public outrage and media campaign. LL: Your book shows that you successfully persuaded the Central Information Commission to ask Delhi Fire Service to publish proactively information about safety aspects of various buildings. Has DFS complied with this? Should not Fire Services in other cities follow suit? Also, do hospitals display boards offering emergency medical treatment to victims of accidents? N&SK: To our knowledge the CIC order is not being followed by the DFS and the hospitals. LL: Do we need an effective legislation to protect the rights of victims in litigation, especially when public prosecutors do not perform their roles effectively? N&SK: Definitely. This is the need of the hour. LL: The Supreme Court has reserved its judgment after the open hearing in your review petition, seeking increased prison sentence on the accused in the Uphaar case. The counsel for the accused convicts, the Ansal brothers, have argued that the sentence of imprisonment for the period already undergone by them, is a composite order, as they have been asked to undergo the remaining part of the two-year sentence in lieu of the fine payable by them. As it came out during the hearing, composite order like this cannot be based on the Indian Penal Code. Did the accused cite any legal precedent or invoke a legal ground, in their written submissions to justify this? N&SK: No case law was cited to this effect. There is no written submission, by the counsel for the Ansals justifying this argument. LL: In State of Punjab v Saurab Bakshi, the Supreme Court's two Judge bench on March 31, 2015, set aside the High Court's reduction of sentence to 24 days in a road accident case, because the accused had paid compensation, and increased it to six months imprisonment. Was this case cited during the arguments before the three-Judge bench in the review case, by either side, as this effectively punctures the argument that payment of compensation can be accepted in lieu of sentence of imprisonment? N&SK: Yes, this case law was cited by the CBI and AVUT during the arguments.